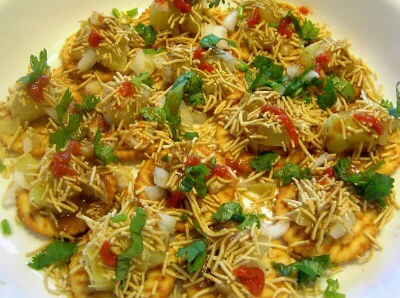 A popular North Indian chaat dish made during festival occasions. Similar to the South Indian Curd Vadai, this Dahi Bhalla (as it is also known) is popular during Holi fesival. 1. Drain the dal and transfer to a grinder. 2. Add asafoetida powder, ginger, green chillies and salt. 3. Grind to a smooth batter and keep aside. Add little water if desired during grinding. 4. Mix cashewnuts, raisins, coconut and a pinch salt in a bowl. 7. Add spoonfuls of the batter into the hot oil. 8. Fry until the vadas become crisp and golden. 9. Remove, drain excess oil and drop them in a bowl of water for 10 to 20 minutes. 10. Meanwhile, whisk the yogurt, milk and sugar in a bowl. 11. Squeeze excess water from the vadas and transfer them to a bowl. 12. Pour the yogurt mixture over the vadas. 13. Sprinkle cumin powder, black salt, sweet tamarind chutney and green chutney on top. 14. Garnish with pomegranate seeds and coriander leaves. 15. Serve at once or serve chilled. 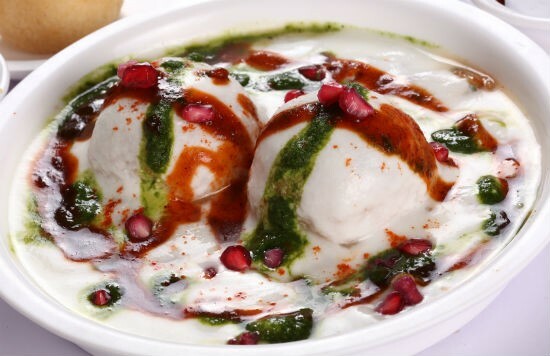 Feel free to comment or share your thoughts on this Dahi Bhalle Recipe from Awesome Cuisine.